August 10, 2018 In addition to campaign invasions, Doom Eternal will have an “internal developed PvP” mode for multiplayer. Multiplayer is hitting Doom Eternal in multiple forms. One of them is invasion where you’ll be able to take control of a demon and invade other players’ games, lending some extra spice to the war between Earth and Hell once Doom Eternal launches. id also plans to have traditional multiplayer once again – but unlike with the last game’s poorly-received online options, this time the studio is handling that development internally. 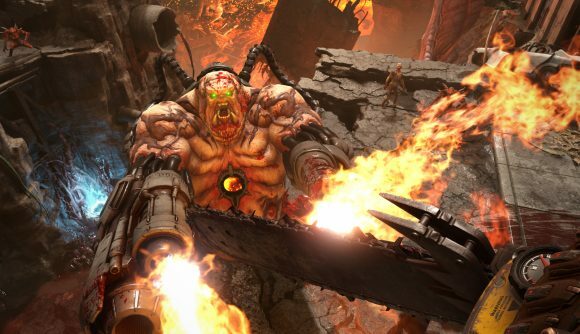 With the showcase of invasions during the gameplay reveal, director Marty Stratton says in a Q&A roundtable “We wanted people to know that we’re making Doom social. That’s just one of the ways. We’re also developing an internally developed PvP component that is new and also very, very Doom. We’re really trying to keep things very Doom-feeling.” Any details on the PvP feature beyond that are, sadly, not coming today. The campaign invasion feature will, of course, be optional – but if you want the added challenge of other players, you’ll have it. You can either become a demon and battle enemy slayers solo, or join up with friends to form a “hunting party” and really ruin a few days. In the trailer, we see Doomguy get warned of incoming invaders via an on-screen message before the enemy players quickly spawn in. We don’t know what all the options afforded to invading players will be, but the two who spawn in during the trailer take the forms of a Revenant and a Mancubus – two of the more powerful basic enemies you deal with in the campaign. Check out the footage below. The invasion itself comes at roughly 15:04. We didn’t get a Doom Eternal release date today, but you can still follow that link for a detailed breakdown of everything we’ve heard about the game so far.